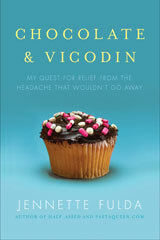 I don’t want the blog to become all “Chocolate & Vicodin” all the time (though that sounds like a hell of a party!). So if you want to keep up with the latest news about the book or anything I’m up to, go to news.jennettefulda.com and/or subscribe to my RSS feed there. Those announcements are also blasted onto my Facebook fan page and I’ll try to remember to Twitter about them too. You can also sign up for my email newsletter at the bottom of JennetteFulda.com which will summarize any important or upcoming news and events. Whew! Publicity is hard work. So many media streams to swim in while trying not to drown. Also, if you see the book mentioned in the media, feel free to tell me about it. I only learned about the two press items above because people contacted me about them. I don’t automatically get notices whenever something is printed about the book. I’m looking forward to all the activity around the book release and I hope you guys enjoy reading what I spent so much time writing! I may not blog again before the holidays, so if not, have a Happy Whatever! Earlier: Is anyone a tax adviser/tax attorney who would give me free advice? So exciting. As a wannabe-published writer, I find it so inspiring that you’re on your second book! Congrats and I hope the book sells really well! Oh, yeah, a chocolate-and-Vicodin party sounds really, really fun. I probably wouldn’t remember any of it, though. I know you’re a published author and all, and your words are how you make your living, but may I steal “Happy Whatever” for my Christmas card next year?? :-) And congratulations, by the way! congrats! cant wait to read it! ill pre order it! >>>>I don’t automatically get notices whenever something is printed about the book. Really? why not set up a google alert for yourself and the book? It’s so easy! @pita – I did set up some Google alerts, but they don’t necessarily catch everything. They didn’t catch those two reviews, so I’m sure they’ll miss other things too. one of those reviews says that your headache is gone. i assumed there would have been a fanfare and some announcement if this was the case. did i miss it? 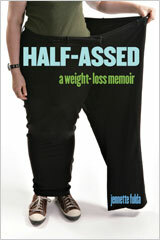 Already ordered my copy of the book and can’t wait to read it! Merry Christmas, PQ! I just know the new year is going to be great for you! @Gretchen – I actually stole “Happy Whatever” from a holiday card I used a few years ago, so steal away! @rfd – Yeah, that review was quite accurate. I’ve learned to accept and better manage my headache, but it’s still here. I just found your blog after buying your book on my kindle!! I am 1/2 through the book and love it! I know you said you didn’t want to hear it but on the news last night there is some new treatment for chronic headache sufferers that has an 80% effective rate. The story was about a young girl that had it for two years and could barely function but nothing showed up on brain scans, etc. Tried this new surgery and pain was gone. Just thought I’d throw it out there since it’s a relatively new thing to be elligible you must have had headache for more than 6 months and be currently in treatment with a specialist. Ok that’s over. I loved your last book and intend to get this one too. and may I wish you a happy whatever too! I think it’s awesome that you’re keeping us all up-to-date with the book-publishing process. It’s awesome, and extremely interesting to boot. @Tracy – If somebody writes a negative review I curl up in a ball and rock back and forth, weeping silently. Ok, I don’t actually do that, but I’ve considered it. As for blurbs, usually the editor coordinates that stuff, so I think if an author decides not to blurb it, the editor protects your frail ego and doesn’t tell you about it. I don’t think anyone writes a negative blurb; they just decide not to blurb. I can’t wait to read your book! Will there be a nook version soon? @Carol Graham – It will be available on Nook. I’m going to the American library association conference in San Diego next weekend, do you know if your publisher will be providing galleys there? Simon and Schuster, correct? I am still waiting patiently for Feb. 22, and still Have my headache from Nov. 03 2009, sounds funny that it was so long ago that my ordeal began. I cannot wait to commiserate with your book, ty for writing it! I will be sure to pick up a copy of your book. Great blog!